The history of the Diocese of PYAY (Prome) dates back to the early times when the Portuguese introduced Christianity to the Rakhine (Arakan) State. Dominicans and Jesuits were the first pioneers who worked hard in these areas. There were also the Augustinian Fathers and the Theatine Fathers who spent much of their zeal and energy but without much success. From 1785 to 1852 no missionary work was possible and very little hope was left. In 1834 West Bengal was erected into a Vicariate and it included Rakhine (Arakan). In 1850 Rakhine Arakan) was restored to Myanmar (Burma) Ecclesiastically under Bishop Balma, the Vicar Apostolic of Ava and Bago (Pegu). In 1870, Rakhine (Arakan) came again under Indian territory as part of the diocese of Dacca. The Holy Cross Fathers worked in Rakhine (Arakan) from 1870 to 1875. In 1918, with the end of the World War I the Holy Cross Fathers resumed the Rakhine (Arakan) apostolate. Sandoway (Thandwe) was opened about 1922 and Gyeitkaw in 1928. In 1927 Chittagon became a separate Diocese from Dacca. Ten years later in 1937, the mission was handed over to the Missionaries of Our Lady of La Salette from the United States. the 21st of May 1961. The La Salette Fathers withdrew from the Mission in 1976 and the administration of the Diocese was handed over to the diocesan Clergy with Bishop Joseph Thaung Shwe as the head of the Diocese. In 1985, Fr Gregory Taik Maung was consecrated as Bishop and became the Administrator of the Diocese. 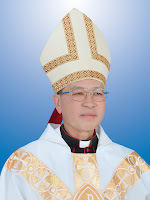 On July 16, 2010, Archbishop Charles continued to lead the diocese as the Apostolic Administrator till the consecration of Bishhop Alexander Pyone Cho. Bishop Alexander Pyone Cho was consecrated at Pyay on Feb. 27, 2011.